R.M.BRAND FARSAN SEV, GHATIYA MAKING EXTRUDER MACHINE. 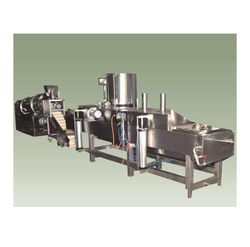 Elbow Type Nylon/ Agra Sev Machine For Continuous Fryer. The Namkeen Extruder Machine provided by us is available to clients in various specifications at economical prices. The Farsan Making Machine provided by us is acclaimed for its easy and convenient installation and maintenance. This machine is used for the preparation of farsan. A standard range of Namkeen Fryer is fabricated using advanced technology from the quality raw materials in conformation with the international quality standards. The use of modern technology and quality materials ensures for compact design, uniform quality and high production capacity. Diesel/ LPG/ Natural gas are used as fuel.